Cupcakes 'n Daisies: Snowball Challenge and Challenging Shopping . . . . .
Snowball Challenge and Challenging Shopping . . . . . I've decided to participate in the Red Snowball Challenge. Allyson saw this quilt in a shop in Utah, Nicole fell in love with it, so the two of them decided to share the fun and host a challenge, thus the "Red Snowball Challenge" was born. The pattern is by Evelyn Sloppy, this is one of the first quilting books I bought. Not only are the patterns amazing, Evelyn's strip set directions are wonderful. I incorporate her stripping methods whenever I can. I will even rework a pattern to use strip sets. I think pieces are easier to fit together when they start out as a strip set. The red snowball quilt pictured above is this pattern, "Leftovers Again?" 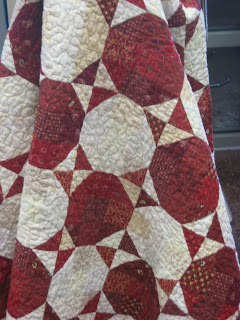 Isn't it amazing how different this quilt looks totally scrappy versus red and cream scrappy? At first I considered doing this pattern using scrappy pink and scrappy brown civil war fabrics. But you know me and red, even though I have two red and cream quilts and two red, white and blue quilts, I figured I could always use one more. Plus I have so many cream and red fabrics, I didn't need to buy any new fabric to make this quilt, you know what that means, it's a free quilt!! Here are a couple of sample blocks I made to get a feel for the project. The finished block measures 6 inches square. Since I have so many red quilts hanging around my house year round, I thought I would add just a little something to this one to give it more of a Christmas feel. I'm going to add some of these Santa faces to the center square of a few of the cream snowball blocks, no more than 8 or 10. I'm also going to add this fabric as a border. I just love this fabric. I made a Irish Chain quilt with this fabric a couple of years ago, it lives in Los Angeles. I'm naming my quilt, "He Knows When You Are Sleeping". Another blogger mentioned she was going to use flannel for the backing, I plan to do the same, making this a warm and snuggly quilt that I plan to nap under. Since I'm adding a border, but also wanting to keep it around the original pattern size of 58" x 70", I'm going to make fewer blocks. Which translates to fewer half square triangles!! Yesterday Nicole blogged about how she's using the Easy Angle to maker her half square triangles for this project. I gave it a try and like this method. I still like to make them a little bigger and square to perfection, but it's really not necessary. If you cut your strips accurately, the hst are pretty much spot on. I sure didn't miss drawing that line down the back of all those little squares. So far I've made 120, only 200 more to go!! On another note, over the weekend I had the opportunity to visit a wonderful quilt shop in Indianapolis, Indiana, Quilts Plus, it was a Better Homes and Garden Quilt Sampler Shop in 2005. They do not allow pictures to be taken in their shop, but if you visit their website, you get a feel for what they have to offer. Could I be a bigger ninny!! You've been busy!!! I love those Santas you plan to add to your snowball challenge quilt. I also like that you plan to use the Santa fabric as your border with a flannel back. It will look so rich with the reds and creams and so original with your Santa. I'll remember the Easy Angle ruler for future reference. Haven't made a lot of hst's because of having to draw the line on all those blocks. I'm all about instant gratification. I am hoping after the holidays (because I keep adding so many last minute gifts to my to make list so have to keep them simple) to challenge myself more quilting. I don't think you are a ninny to have the willpower to browse through a beautiful quilt store and only purchase three fabrics. I love the three you chose. Just being able to shop and browse through a store like you describe sounds wonderful. I'll bet you came away with lots of ideas even if not with tons of fabric and a large credit card charge. What she (Rene') said.... me, too! I think that is going to be a great quilt! Thelma, you are brilliant with the little Santas! I love that idea and think it's awesome. I thought about putting just one green snowball in some random spot in the quilt to make a little Christmas surprise, but then I decided not to. I want to pull this quilt out for Valentine's Day and July also. But now I'm thinking your border idea looks so tempting....you always put your own little spin on things and it's so refreshing. Phooey on Quilts Plus for not allowing pictures. There loss for the free advertising. Although, if they're in Quilt Sampler, I'm sure I'll love their store even without pictures. And your three blues are lovely. You spent $7.77. Is that lucky? the Santas make perfect centers for your snowballs. What a wonderful idea. I've been in several shops that would not let me take photos. And a couple more that let me take the photos but only of what they told me I could. I love the Santas in the snowball center. Cute idea! I love your santas in the snowballs. Very cute! And you're not going to super-size it? I'm shocked! You showed great restraint in the quilt store. I need to take lessons! My cousin is in on this quilt and swapping the fabrics. I'm almost jealous except that I have UFO's that are calling my name. I know once I see your red/white one, I will wish I had done it anyway. I'm looking forward to your finish.